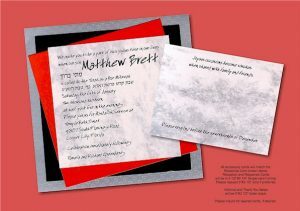 Consider adding a special dedication to the backside of this Bar Mitzvah invitation. Other color combinations are available. 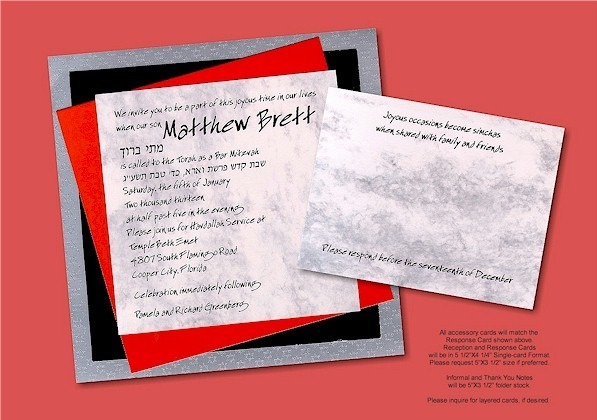 This contemporary layered Bar Mitzvah invitation gives a nod to tradition with the marble invitation card layered over chrome red and black layers at alternating angles and a silver back card printed with rows of tiny Jewish stars in silver ink for a tone-on-tone effect. Measures 7 1/2″ square,. Shown with Black Ink and typestyle Especial Kay. Single white linen finish envelopes accompany this invitation. Please allow additional time for production of this invitation. Please note: Due to the square shape of this invitation, additional postage is required for mailing. Please consult your local post office branch for details. Special Dedication available at no extra charge! Please request this special service if desired. 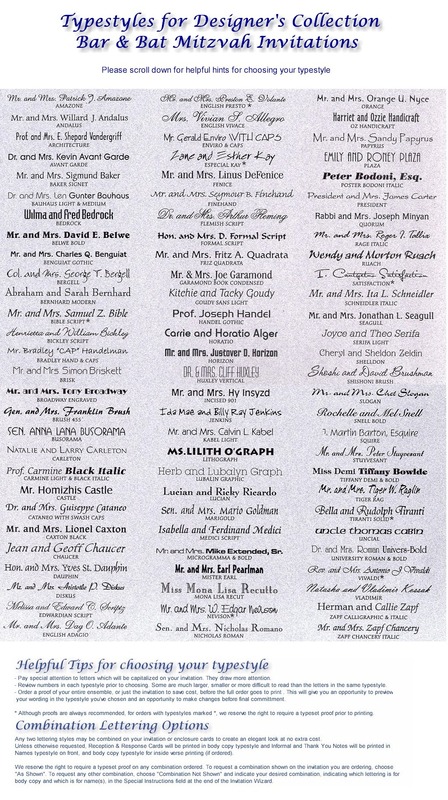 For invitation orders with Hebrew, a proof of any portion of the order with Hebrew wording is mandatory. Please order proofs on the last page of the Invitation Wizard. 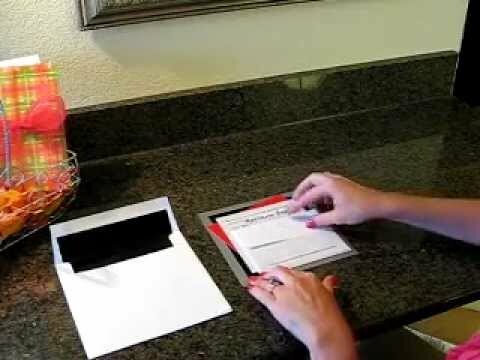 Envelopes can be lined for an additional charge of $34 per 25. Return Address will be printed on the back flap of the envelope, if desired. Thank You notes will be printed with Thank You on the front and may include a short verse or names inside (or below, in the case of single-card format Thank You Notes) for an additional charge. A verse or printing inside (or below) is available on thank you notes for an additional charge of $67. Note: If ordering both Informal and Thank You Notes, you may choose combined quantity for printed return address.